At the risk of revealing myself to be a typical blunt American with no grasp of subtlety, I admit that this book reminded me of Downton Abbey. No matter that Robertson's novel is set in 1780, about 150 years before the characters of Downton would come to sip tea and die unforgivably capricious deaths—to my uncivilized eye, English culture appears largely unchanged from one century to the next. Whether the characters ride in carriages or cars, whether they light their homes with candles or electric lights, their unspoken social rules and stiffly formal manners remain constant. 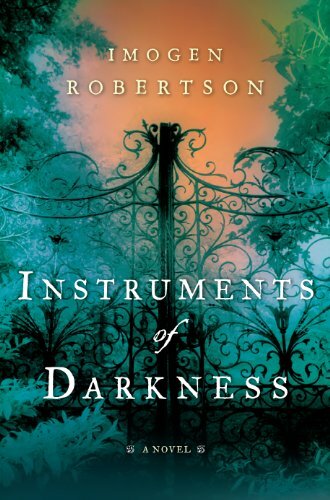 Robertson's two main characters are a delightful, if unlikely, pair of amateur sleuths. Harriet Westerman has spent much of her adult life on the sea while her husband serves in the navy, but is now living without him at Caveley Park with their two children. She is no shrinking violet, as she proves when a body is found on her land. Instead of delegating the distasteful tasks to others, Mrs. Westerman goes immediately to her reclusive neighbor, Gabriel Crowther, an anatomist. Crowther is given a wide berth by most people in town, as they are intimidated or disgusted by his interest in cutting up and studying cadavers. Mrs. Westerman, however, knows Crowther is just the person to help her discover the identities of the murdered man and the person responsible for his death. Crowther and Westerman quickly strike up a bantering, amiable friendship as they pursue clues and study the crime. The body count rises, and the deaths can't all be written off as accidents or suicides. The closer they get to the truth, however, the more danger they are in, as someone doesn't want his secrets to be discovered. The murder mystery Robertson has conjured is a satisfying, well-layered one, but the real treat is the relationship between the odd couple of detectives. Crowther is the type who would much prefer to keep to himself and thinks himself too old to be of much use, but he thrives under the pressure and excitement of their investigation. Mrs. Westerman is a strong, intelligent force of a woman, who needs an outlet for her energies now that she is back on dry land. They quibble, they squabble, and Crowther sometimes responds inadequately to Mrs. Westerman's flights of emotion, but it's clear they bring out the best in each other. Their dialogue brought to mind scenes between Penelope Wilton and Maggie Smith on Downton—Mrs. Westerman as the empathetic Wilton, and Crowther as the crotchety-but-good-hearted Smith. If you enjoy this book, you can continue the genteel fun with the three subsequent Crowther and Westerman books in the series.